(3) sky-rocketing retiree health care benefits. The combination of these three problems leaves New Jersey with an $11 billion deficit this year and two “out year” problems of gigantic proportions: the state’s pension obligations are woefully underfunded and the state hasn’t funded retiree health care benefits at all. Gov. Christie believes, correctly, that most New Jersey residents won’t stand for (and can’t afford) tax increases. So the only way out is to cut spending as quickly and deeply as possible. This agenda (of aligning costs to basically stagnant revenues) has catapulted Gov. 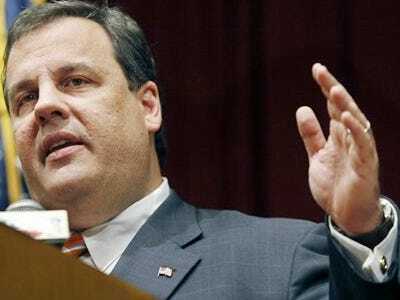 Christie into the forefront of state and national governance. He’s become a political superstar in conservative circles. He’s riding the major domestic political issue — massive public debt and its restructuring — of our time. The question is whether he can muscle his agenda through the Legislature and, if he does, whether it will be enough to forestall the avalanche of debt that threatens to bury the state in insolvency. Matt Bai has a long profile of Gov. Christie in this weekend’s New York Times Sunday Magazine that chronicles his unlikely rise and the daunting challenge ahead. Bai’s piece is quite favourable. But conservative analysts are starting to criticise Gov. Christie for not following through on his promise to slay the debt dragon and the army of interests that protect it. New York Post columnist Nicole Gelanis writes: “Christie risks disappointing his fans: His new budget doesn’t build enough on last year’s foundations — or on the governor’s political capital.” Pension blogger John Bury’s criticism is much harsher. People argue over whether New Jersey or Illinois (or California) is ground zero for the state and municipal debt crisis. We vote for New Jersey, but we’re open to a different view. Regardless of who’s right, what happens in New Jersey will inform much of what happens across the nation. If Gov. Christie, with all his zest for the task, can’t make it work in New Jersey, his will not be the only state that fails.